Tragic German star Peter Lee Lawrence stars in a spaghetti western mystery thriller featuring stock villains Eduardo Fajardo and Nello Pazzafini in unusually sympathetic roles. 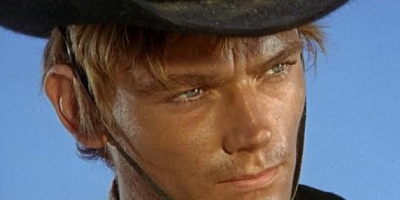 Whilst firmly in the middle tier of spaghetti westerns, Killer Adios has more than enough charms to entice the casual spaghetti western fan. Lawrence is an impulsive gunslinger who learns, to his cost, that when you shoot first you can’t always ask questions later. An incident in his youth sees him leave his hometown in disgrace but years later he is invited back to settle a power struggle between two rival factions. There are very few straight ahead gundowns with most victims executed by an unseen assailant, allowing the film to develop its fair share of red herrings. The convoluted thriller elements help build momentum towards an exciting and genuinely unpredictable, if somewhat illogical, ending.